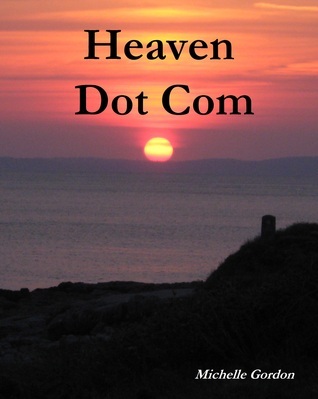 Ten years ago today, I published the very first edition of Heaven dot com. I had written the novella when I was 15/16, and in 2007, the age of print-on-demand was dawning, and having always wanted to be an author, I just wanted to see my name on a book, my words in print. I had no idea, at that point in time, that it would be the beginning of my journey as an author. At that point, all I had written was short stories, poetry and the novella. Though I dreamed of writing full length novels, I honestly didn’t think it would be possible for me. But apparently, it was possible. 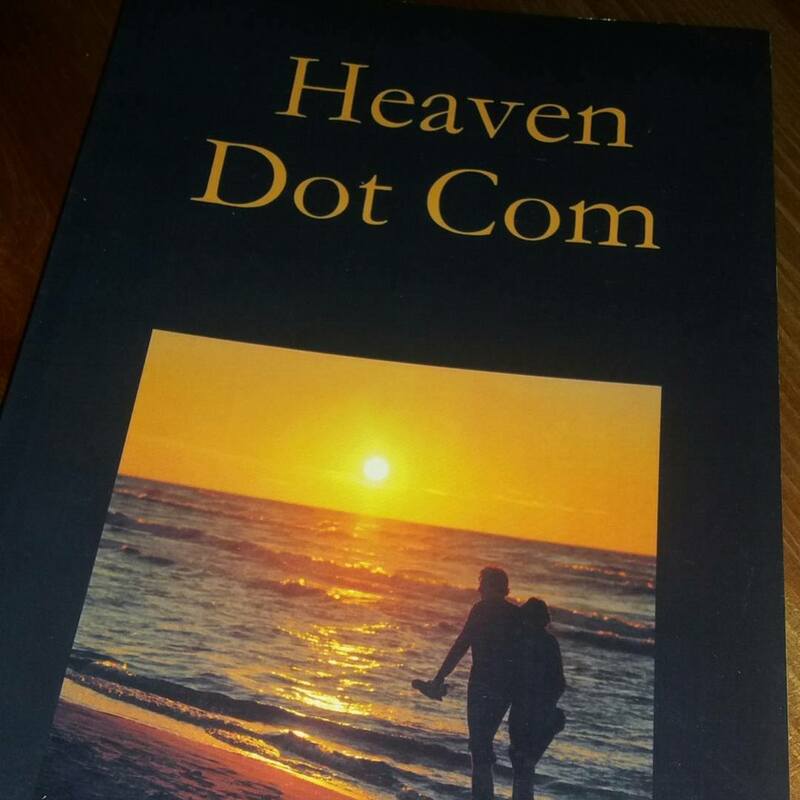 Heaven dot com is a story of love, and hope, and though I cringe a bit now when I read it, because there is so much I would change in it if I could, it was the spark that ignited my calling. And the fire has continued to burn for a decade. For such a tiny book, it has had a pretty big impact on my life, and I know it has impacted the lives of others too. I recently made this quote picture for I’m Here, because I love this picture, in fact, I very nearly used it for the cover of the book! Despite being the hardest book I have written yet, on an emotional level, I’m Here is my favourite of the Visionary Collection, because it illustrates the unconditional love possible between two people, even when the circumstances are not favourable. While searching for a quote, I re-read the end of the book, and it still strikes so many chords deep within me, and I know that it has done the same with many others. Several readers actually broke up their current relationships after reading I’m Here, because they realised that they were not experiencing the kind of relationship they really wanted, and that they deserved the kind of love that the characters in the book were experiencing. I’m Here helps to remind me that the ones we have loved who are no longer here, are just in a different dimension, and that they never leave us. All we need to do is speak their name, and they are listening. It also reminds me that our Guardian Angels are also always with us, and are waiting to help us. All we need to do is ask. If you have read I’m Here, please consider leaving a review on Amazon, and comment below with your thoughts on the story or the characters. I would love to hear from you! You know when you haven’t spoken to someone for so long, and so much has happened, that you don’t know where to begin? Yeah, that’s how I feel right now. I have not blogged since May, and it feels like the longer I leave it, the harder it gets to know where to start! First of all, apologies for my blog absence, I have been away in America and Canada, and I had so many amazing experiences, that I plan to create a blog series about it all, including some of the awesome photos I took of the places we went to. I’m not quite ready to begin the series, because I literally took thousands of photos, and I have been so busy with work since I got back, that I haven’t even had a chance to look at them yet! But it will be coming soon, I promise. I did post some of my photos on Instagram along the journey, you can see them here. 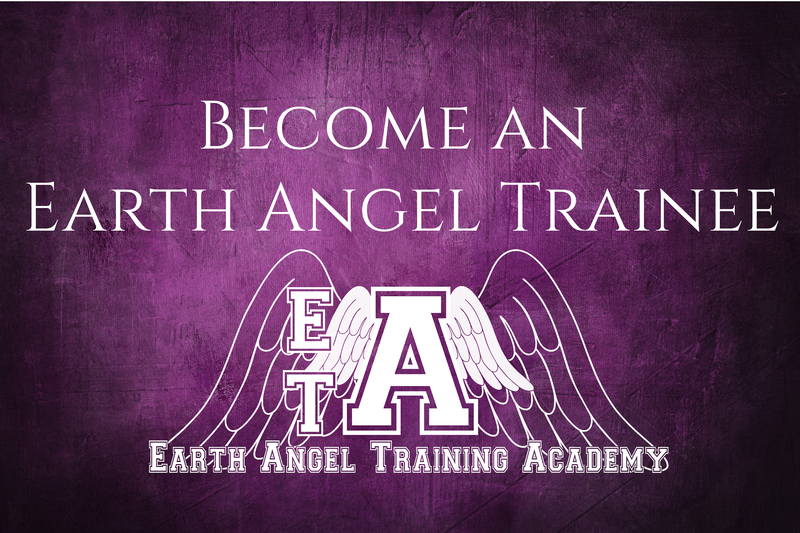 I’ve also set myself some deadlines for the remaining classes in the Earth Angel Training Academy, my apologies to those waiting for the four final classes, they will be published by the end of August. I appreciate your patience! While away I began writing the 8th book in the Earth Angel series, and I intend to continue, and publish it in early 2017. The 7th book will be out by November 2016, I will post more updates soon! I am working on an Earth Angel series for Children, but I have no publishing dates set for that yet. I am formatting the rest of the Visionary Collection for Smashwords, which means then that all of my books will be available on all the possible platforms. I have an exciting new project to help Indie Authors and creators, and I will be announcing that officially very soon! Hmm, I realise that I have just put my massive to-do list out to the world right now, but I figure it’s good to have some accountability! I am working on many publishing projects for clients right now, and I am so excited to help them bring the work out into the world. I will announce them here too when they are published. 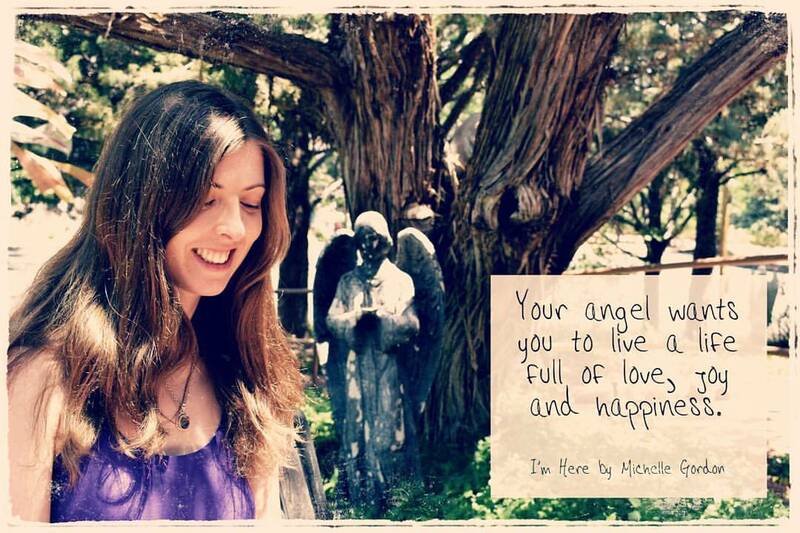 Here’s a quote photo for you 🙂 It was taken in the garden of the Unity of Sedona, the quote is from I’m Here. I love Dory. I have a memory just like her, and I’m excited about her new movie coming out – Finding Dory. But don’t worry this post isn’t about a forgetful blue fish. Two weeks ago I finished writing my last novel, called The Twin Flame Resurrection, and have since been doing the basic first edit ready to send it out to my beta readers and get feedback before the first main edit. I plan to get it published by October, which is quite a tight deadline, but completely possible. But just to make things interesting, I have decided to keep writing, and start the next Twin Flame book in the series, tomorrow. 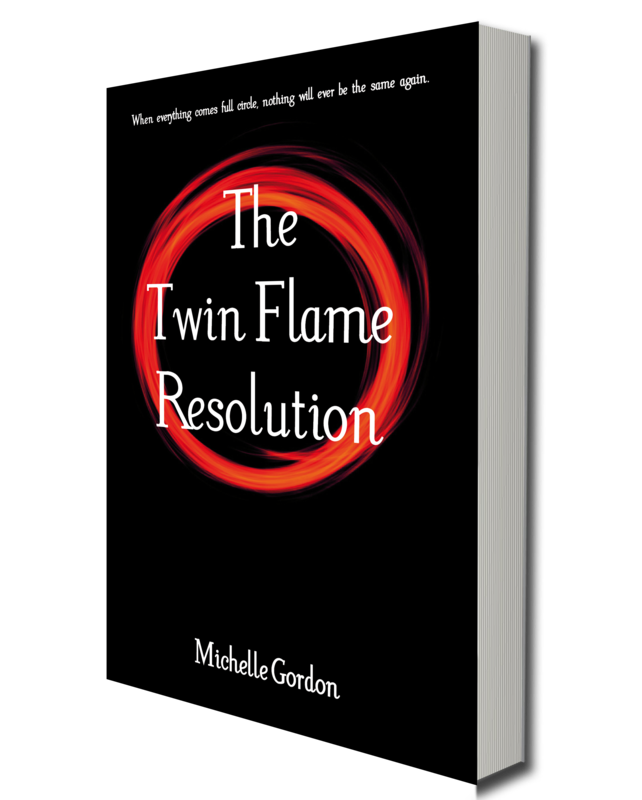 I did the same thing last year – within two weeks of finishing The Twin Flame Reunion, I wrote The Twin Flame Retreat, and I wrote it in a crazy two weeks. After reading a very interesting post by Russell Blake on how to sell loads of books, I was interested to see that his 6th point was to do 25% marketing, and 75% writing. I would say that currently, I have been doing the exact opposite. I market a lot more than I write. And I have decided to change this around. Also, my numbers for the Earth Angel series have changed. I am now thinking that there is likely to be thirteen books in the series in total, and if I were to stick to my current formula of publishing one Earth Angel book per year, I figure it will be 2023 before the final book is released. That is just too far away! So, the only way to increase the number I publish each year and get the series out faster is to write more than I market (and procrastinate). I am also desperate to get writing another trilogy I have in mind and more books in the Visionary Collection. In which case, I really do need to just keep writing. So there may be a few less blog posts over the coming month again, as I throw myself fully into another novel. I have to admit, I haven’t got a clue what will be happening in this one, which characters will appear, what dramas will unfold or who might not make it to the final page, but I’m excited to be jumping back into that world so quickly, because everything seems to flow so much better when there isn’t too much of a gap in between books. If you are a fan of the Earth Angel series, and there a character you would like to see featured in the next book, comment below or on Facebook or Twitter. I will see what I can do! Today my sister came to visit me. For those who don’t know her, she is the awesomely talented graphic designer who created my beautiful Visionary Collection covers, the back covers for the Earth Angel Series and also did my last set of author photos. 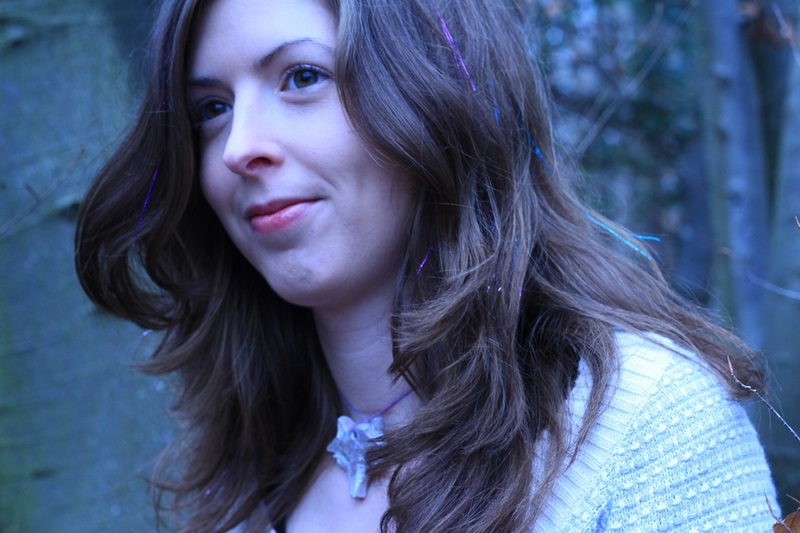 We went for a little wander in the woods today to take some new author photos, as I felt an update was needed. 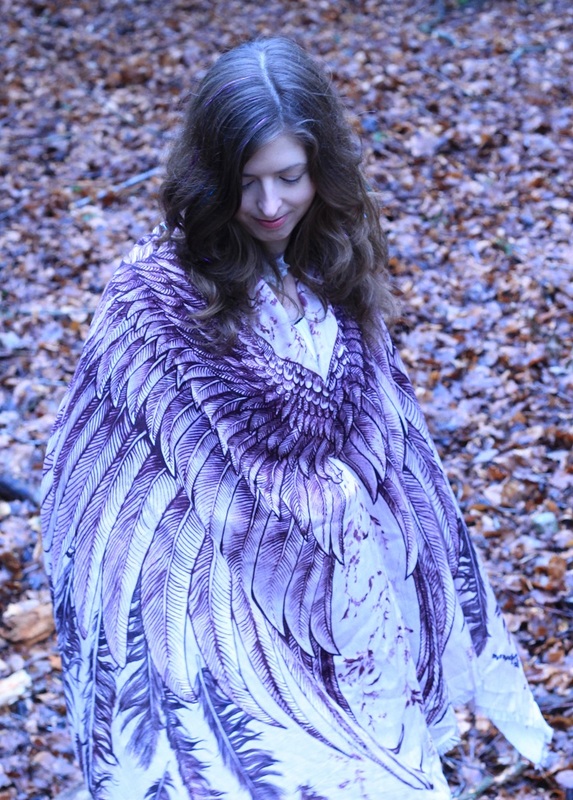 I wore my beautiful new hand-carved fox pendant, and my angel wing scarf. We had fun taking over 400 photos, and before she left this afternoon, Liz transferred some of the pictures to my computer. Out of all of them, there were a few favourites, and I wanted to share them here with you first! I may share some of the silly ones at some point too. 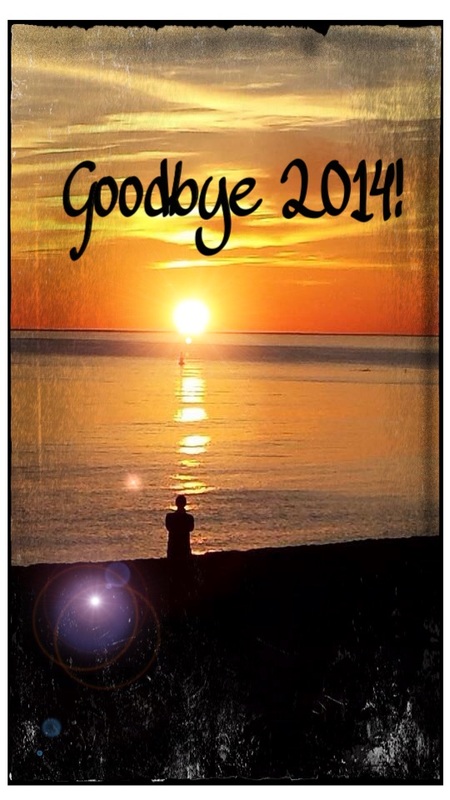 2014 was a weird year, both a long and a short one, a happy and a sad one. Just thought I would write a summary of the year, in order to acknowledge and release the old, to make way for the new that 2015 will bring. It’s a long post, so grab a cuppa! I started the year with an amazing Harry Potter themed birthday party. I had mixed feelings about turning 30. Part of me was more than ready to say goodbye to my twenties, and another part of me was listing all of the things I had hoped to have done by this time but hadn’t. In truth, as I near my 31st birthday, I don’t really feel all that different, and when I tell people my age, it feels merely like a random number, than something that has any significance. Also in January, I began my ‘Ask an Angel’ Oracle readings on my YouTube channel, inviting people to ask Aria, Amethyst or Velvet a question which I would then answer with their oracle cards. In 2014, I recorded twenty readings, and half of those were questions about Twin Flames, which is what inspired me to write more on the subject, as you can see from the many posts now on my blog. My most popular blog post in January was my views on how to deal with criticism, after becoming the subject of derision in someone else’s blog. In February, I embarked on the Man Brain Box Experiment, and though I only did it for a week, it did remind me that in fact, having a single focus make you far more productive than if you are to multi-task. I think it’s increasingly difficult, in this age of the internet and social media, to retain a single focus on anything, with so many demands for our attention (she says, surrounded by her phone, iPad and open tabs on her laptop) it can be difficult to shut out all the distractions and get on with something, and put everything you have into it. But I do think it’s worth it. In March, I finally finished writing I’m Here, which I had started and stopped writing two Novembers previously and seemed to be stuck on. I was so happy to finally finish it, and when coming up with cover ideas, I had the inspiration to change the covers of three of my previous books, and bring them together into a collection. With the help of my awesome sister, I then set to work on getting the new covers of the Visionary Collection sorted out, and I released the whole collection, including the new book, in May. The paperbacks were delayed by technical issues, but finally came out by August. In March I also had a few realisations on my plans, and on whose advice to listen to, and when to take it with a pinch of salt. I also discovered the wondrous joy of Scapple and had a go at using the Chronodex to organise my life. In April I celebrated the 5 year anniversary of the birth of the first few words of the The Earth Angel Training Academy, and reviewed the journey with the book so far. 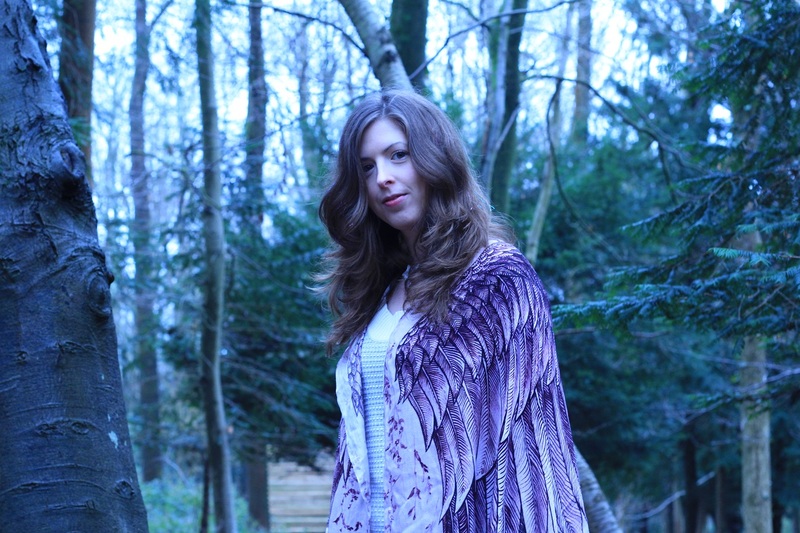 I took part in the Wellness Symposium in Cirencester, I was nominated for the Versatile Blogger Award, and I revealed the new covers for the Visionary Collection for the first time. In May I embarked on the I’m Here Book Tour, to celebrate the release of the new book, by giving away little cards all around the world, that contained a QR code allowing you to download a free PDF copy of the book. I had so much fun with this idea, and was really pleased with how it went. You can see the map of where the book was downloaded, and the link will remain active, so if you haven’t yet read I’m Here and would like to, please click here to download your free copy! If you have read it, and you enjoyed it, please do leave me a review on Amazon, I’d really appreciate it. 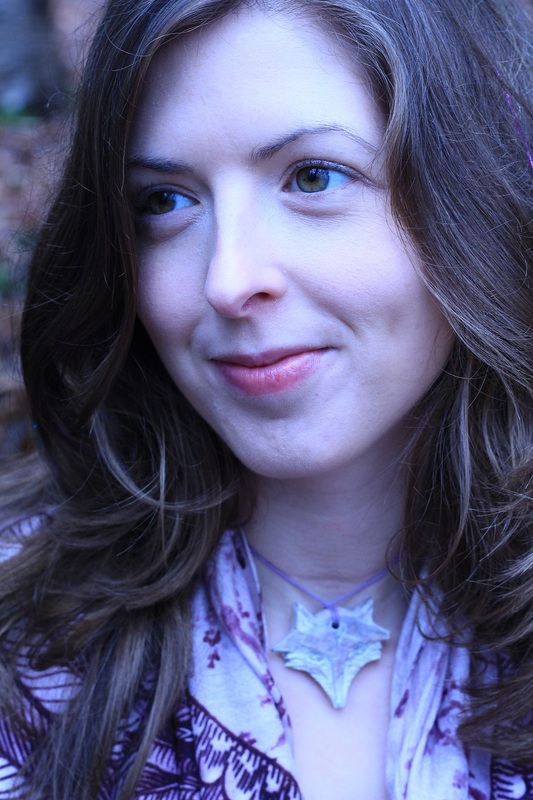 The tour continued with gusto throughout June, and in that month I teamed up with Sarah Vine, founder of the Earth Angel Sanctuary, to offer her members a free copy of The Earth Angel Training Academy, and I also wrote a letter to all Twin Flames, after seeing so many beautiful souls searching for answers on the subject. In July, I attended the Healing Weekend, and had an amazing time, I recorded the first chapter of The Elphite as an audiobook, I recorded a video of some crazy deer in the garden, which went viral on YouTube (over 26k hits now! ), I did a talk and sold books at the MBS Psychic Fayre in Newport, and I relaxed and went with the flow when things seemed to be going very wrong. In August, the paperback editions of the Visionary Collection became available on Amazon, I was interviewed by Sarah Vine, and I embarked on a new adventure to the vibrant city of Brighton. 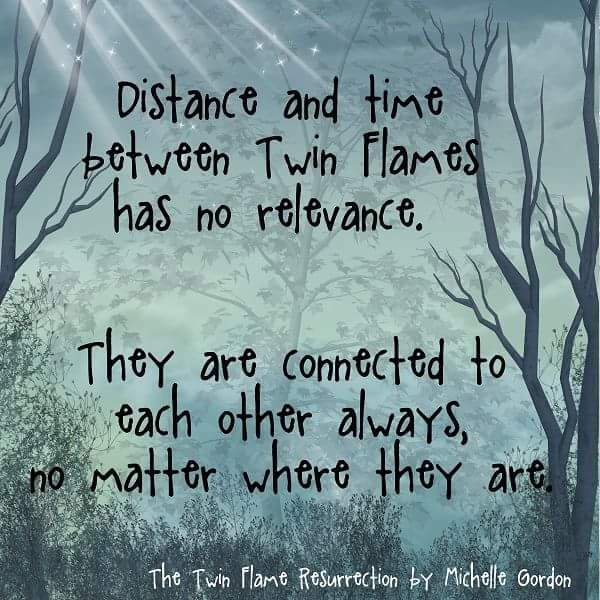 I began to write more about Twin Flames, and at the very end of August, I started writing my latest book, The Twin Flame Reunion. I met one of my fans, Chip Jenkins, who is now one of my closest friends. September was my quietest blogging month of 2014, due to my full time job, doing 50 hour weeks left me with little energy to write. I blogged about listening to your own intuition, and then at the end of the month, about knowing your own worth and not settling for less. The highlight of the month came in the form of a beautiful letter from a man who had decided that his life was worth living after reading The Earth Angel Training Academy. 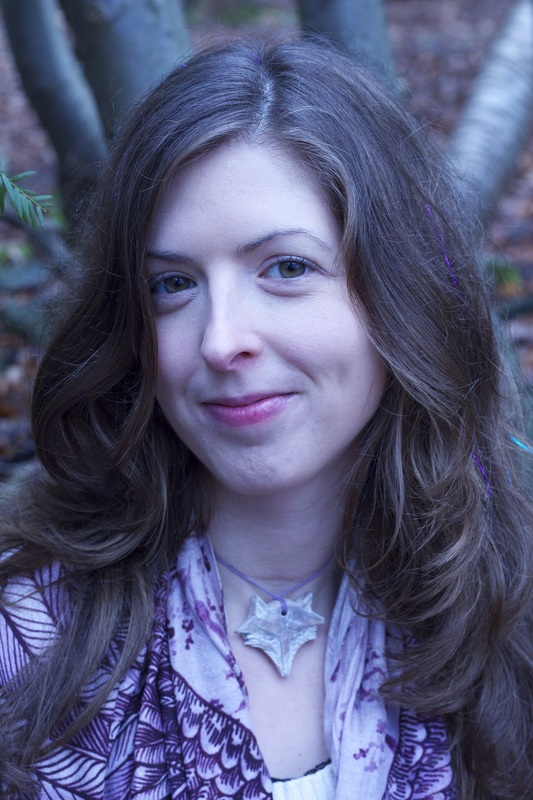 In October, I took part in the Writer’s Blog Tour, I finished writing The Twin Flame Reunion and I started offering guidance sessions to fellow Earth Angels. In November I released the cover for the Reunion, I blogged about the idea of changing our own fate, I started writing the next book in the Earth Angel series – The Twin Flame Retreat – and completed it in two weeks, and I released the Visionary Collection Kindle Boxset. In December, I celebrated winning Nanowrimo, even though I didn’t join in until the 16th November, I released the Earth Angel Series Boxset on Kindle, I started my Adventure with Astrid, and I decided to spend my Christmas in London, taking part in the Basket Brigade and volunteering for Crisis for Christmas. I also packed up and left Brighton, and am currently figuring out my next move. So to sum up – a pretty busy year, lots of changes, challenges, high and low points, and I feel like 2015 will be the year where everything comes together and begins to make more sense. Or at least, that’s the hope! I can see now that I achieved quite a few things, and I feel that in 2014 I created some very important connections that will make 2015 far more spectacular. Congratulations Wenna! 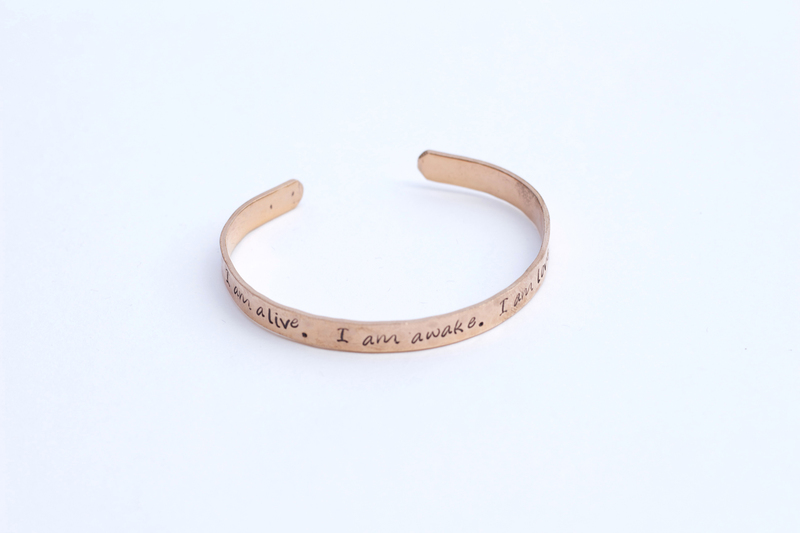 I will send your bracelet to you asap! Thank you to you and t everyone else who entered the giveaway with a comment on my blog or Facebook on what you would do with 20k. To all who entered, to receive your free PDF copy of The Elphite, please email me at theamethystangel@hotmail.co.uk and I will reply and attach the file to the email. Please put – The Elphite – in the subject heading. Stay tuned for more mini giveaways in the run up to Christmas and the release of the latest book in the Earth Angel Series. 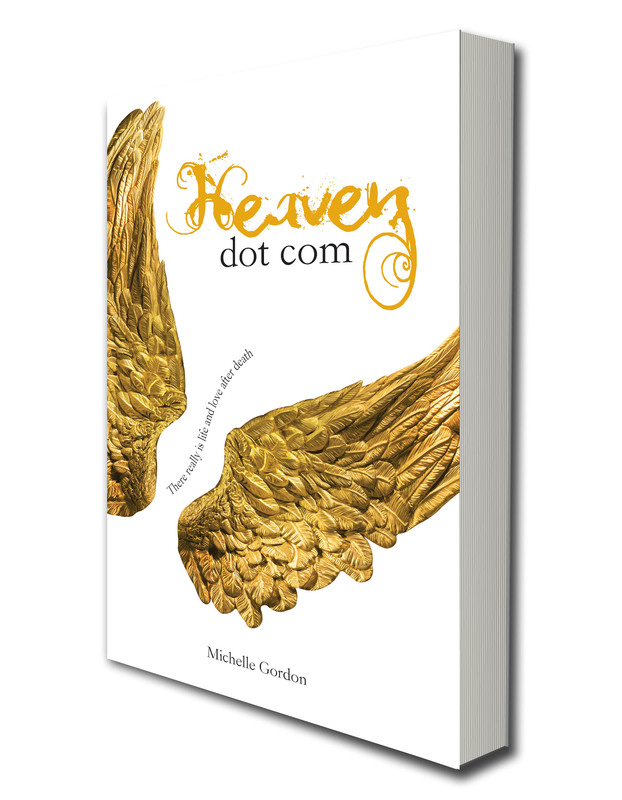 In preparation for creating the audiobook versions of the Visionary Collection, I was reading through Heaven dot com, and I realised that I hadn’t heard the song I mentioned in it – Anyway, Angel – for over ten years. The band who wrote the song, etcha, who are also mentioned in the book, was a band my brother played bass guitar in. I have no idea why I am confessing these very embarrassing teenage stories here, I suppose I just started thinking about the times surrounding the writing of Heaven dot com. Part of me cannot believe it was fourteen years ago, and yet another part of me feels like it was a completely different lifetime. The interesting thing is, that it was during my teenage years that I began channelling stories and poetry, even though at the time, I didn’t understand that was what I was doing. Years later I would find pages filled with words in my scrawl that I had no recollection of writing. I would find beginnings of stories I never finished and I would have no idea where the story had been heading or even what had inspired it. I also remember a story I started writing, that I think I may still have somewhere, about ghosts, and though I was doing well with it at first, I suddenly got a clear vision of how the story was going to end, and so I wrote the last chapter. What I learnt from that, is that I am very much a sequential writer – because though I loved the story, I had basically spoiled the ending for myself and now had no interest in writing the middle. These days, if an idea for the ending comes up, I make notes, but I do not let myself write the ending, for fear that I will not write the middle. It has worked for me so far! It’s interesting how writing habits are developed, and the reasons why creative people do things in a certain way. Visionary Collection – Now in Paperback! The Visionary Collection is now available from Amazon in paperback! Not only do they have beautiful new covers, but they have also had another edit, so there have been many minor changes, though the stories of course have remained the same. The Doorway to PAM also includes a bonus at the back – the mini non-fiction book I wrote – Choose Your Own Reality. It also features the recipe for the famous Cherry and Coconut cake mentioned in the story. I’m so pleased that I’m Here is now available in paperback, it feels more real now! The I’m Here Book Tour is still continuing, and I have been getting more download notifications, you can keep up to date by checking out the News section on the website. Now I have released the paperbacks, I will be doing the distributor prize draw in the next week, so I will keep you posted! There have been a great many changes taking place over the last week in my life, and I will write some blog posts about it soon, but I want to just say to all the Earth Angels out there who may be sensitive to these shifting energies – hang in there. I was lucky enough to have my very supportive Angel friends around me this week, helping me to see the light in what felt like absolute darkness, and without them, things would have seemed completely hopeless. So if you find yourself in the darkness, reach out to someone who can help you to turn on the light. Don’t stumble in the dark on your own.